Millions of healthcare workers are exposed to chemotherapy and other hazardous drugs annually. Studies have shown that exposure to these hazardous drugs can cause serious health problems, �such as cancer, reproductive and development problems� and other adverse effects that can be irreversible even after low-level exposures,� according to the Occupational Safety & Health Administration (OSHA), National Institute of Occupational Safety & Health (NIOSH), and Joint Commission. Many institutions have adopted Closed System Transfer Devices to protect workers from exposure to chemotherapy and other hazardous drugs, but today�s CSTDs are not complete solutions. 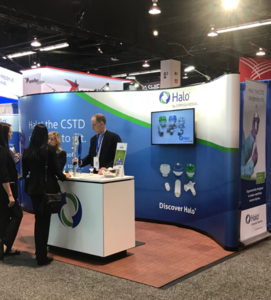 It�s time for a smarter Closed System Transfer Device solution designed to solve these issues � discover Halo. Review CSTD comparisons and studies for usp 800 regulations. Research the use of closed system transfer devices to prevent needle sticks and toxic vapors from chemotherapy preparation and compounding, including splash for healthcare workers, pharmacists, nurses, pharmacy techs. Minimization of hazardous drug exposure for pregnant healthcare workers, NIOSH regulations and sterility maintenance. Compare Needle-free systems and leur-lock compatibility including training and assembly requirements for CSTD and locking mechanisms. 7-Minute Video | CSTD perspectives from 5 industry thought leaders. 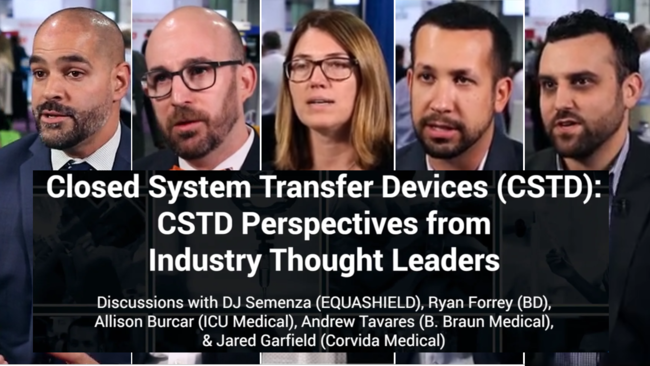 CSTD perspectives from five industry thought leaders: Discussions with DJ Semenza (EQUASHIELD), Ryan Forrey (BD), Allison Burcar (ICU Medical), Andrew Tavares (B. Braun Medical), and Jared Garfield (Corvida Medical). These industry experts answer the following questions: What are CSTDs? Why do pharmacists and nurses use CSTDs? How do CSTDs help protect healthcare professionals form hazardous drugs? What factors should be considered when choosing a particular CSTD? 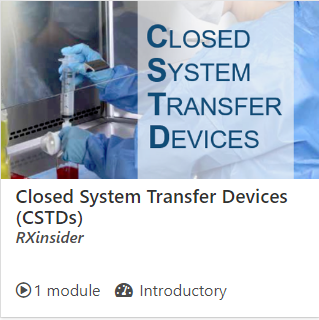 The following 9-minute course is an overview of Closed System Transfer Devices (CSTDs) and their application in the health system and infusion settings. This course answers the following questions: What are CSTDs? Why do pharmacists and nurses use CSTDs? How do CSTDs help protect healthcare professionals form hazardous drugs? What factors should be considered when choosing a particular CSTD? Closed-System Transfer Devices (CSTDs) | A comparison of CSTD manufacturers. The following comparison matrix was developed as a complimentary service for anyone in the beginning stages of research. Due to USP 800 becoming enforceable in December 2019, CSTDs will be required for hazardous drug administration and recommended for hazardous drug preparation. A closed system drug transfer device or "CSTD" is a drug transfer device that mechanically prohibits the transfer of environmental contaminants into a system and the escape of hazardous drug or vapor concentrations outside the system. Open versus closed systems are commonly applied in medical devices to maintain the sterility of a fluid pathway. CSTDs work by preventing the uncontrolled inflow and outflow of contaminants and drugs, preserving the quality of solution to be infused into a patient. Theoretically, CSTDs should enable complete protection to healthcare workers in managing hazardous drugs, but possibly due to improper handling or incomplete product design, contaminants can still be detected despite use of CSTDs. Source: Miyake, Tomohiro; Iwamoto, Takuya; Tanimura, Manabu; Okuda, Masahiro (2013-06-21). "Impact of closed-system drug transfer device on exposure of environment and healthcare provider to cyclophosphamide in Japanese hospital". SpringerPlus. 2. doi:10.1186/2193-1801-2-273. ISSN 2193-1801. PMC 3698436. PMID 23853750. A 44-page document that describes, in detail, the NIOSH testing protocols used for CSTDs. This document details which compounds were tested, what the conditions were, which CSTDs were tested, specifics on how they were tested. This document reads very similarly to a student lab report. Arisure manufacturer website that describes the newest CSTD to enter the market. 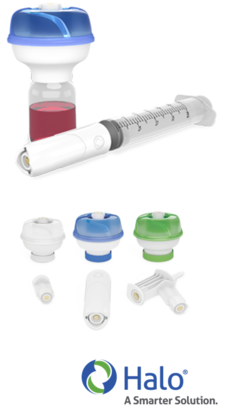 Website describes some features that are exclusive to the Arisure, as well as separate sets of specific reasons why this product is appealing to nurses and pharmacists. ChemoLock CSTD manufacturer website that describes all of the features of this device, especially focusing on its ease of use and safety for healthcare workers. This site also illustrates all of the available components. This study's aim was to determine how HD might spread through touch after handling contaminated vials in simulated pharmacy and nursing environments. Results show residue from HD vials spread as vial was handled in a pharmacy environment in 4 of 5 CSTDs, contaminating pharmacy PPE, ancillary products, and nursing PPE. No HD residue was detected on PPE, ancillary products, or nursing PPE in the pharmacy after using the SEVA system, providing an effective means to contain HD for drug transfer from vial to delivery system. Call E, Bill B, McLean C, Call N, Bernkopf A, Oberg C. Hazardous Drug Contamination of Drug Preparation Devices and Staff: A Contamination Study Simulating the Use of Chemotherapy Drugs in a Clinical Setting. Hosp Pharm. 2017;52(8):551-558. A Saudi Arabian study, published in May 2018, that sought to compare 3 CSTD�s (PhaSeal, Equashield II and ChemoLock) on their compounding efficiency and ease of use among pharmacy technicians and nurses to determine which product would be most suitable to adopt into their hospital protocol. Nurgat ZA, Lawrence M, Elhassan TA, et al. Comparison of closed system transfer devices for turnaround time and ease of use. J Oncol Pharm Practice. 2018;0(0):1-10. The purpose of this cost determination analysis is to appraise the direct and indirect costs of using a closed system transfer device (CSTD) to prevent occupational exposure to hazardous drugs. The data is from 2011, but is one of very few online resources about the cost of CSTDs. Barnachea L, Lee T, Gitler J. et al. Cost determination study of closed system transfer devices (CSTD). ICU Medical Inc. 2012. The objective of this randomized, prospective and controlled study was to investigate the ability of a closed-system transfer device (CSTD; BD-Phaseal) to reduce the occupational exposure of two isolators to 10 cytotoxic drugs and compare to standard compounding devices. This study confirms that using a CSTD may significantly decrease the chemical contamination of barrier isolators compared to standard devices for some drugs, although it does not eliminate contamination totally.Simon N, Vasseur M, Pinturaud M, et al. Effectiveness of a Closed-System Transfer Device in Reducing Surface Contamination in a New Antineoplastic Drug-Compounding Unit: A Prospective, Controlled, Parallel Study. PLoS One. 2016;11(7). Equashield device manufacturer website that illustrates the Equashield device and describes all of its available features. It also describes why CSTDs are necessary in the hospital and what exactly they do. It specifically details how the Equashield is better and different from the other marketable CSTDs. Halo device manufacturer website that illustrates the Halo device through a video and several pictures, and also describes this device and how it is superior to the other devices on the market. Learn about Corvida Medical's Halo CSTD and how it protects patients and healthcare providers from hazardous drug exposure. Short article that discusses how using CSTDs can save hospitals money by reducing waste, which is a point that hospitals will certainly consider when deciding which CSTD system to invest in. Boyle AM. Closed system transfer device reduces chemotherapy drug waste. US Medicine. October 7, 2013. Leakage from closed-system transfer devices as detected by a radioactive tracer. A study of leakage from selected closed-system transfer devices (ChemoClave,, OnGuard, PhaSeal) under experimental conditions is described.Nine manufacturer-trained oncology pharmacists and pharmacy technicians volunteered to participate in an experiment to determine the degree of leakage of a liquid test agent (a radioactive technetium isotope [(99m)Tc] diluted in normal saline) during CSTD-assisted transfer of liquid from vials to syringes per standard practices. The volume of leakage was significantly less with PhaSeal than with OnGuard and ChemoClave when pharmacists and pharmacy technicians used the three CSTDs and (99m)Tc as a tracer. De Ausen L, Defreitas EF, Littleton L, et. al. Leakage from closed-system transfer devices as detected by a radioactive tracer. Am J Health Syst Pharm. 2013; 70(7): 619-623. OnGuard device manufacturer website that describes the OnGuard product and addresses the need for this device in the hospital in light of the upcoming, enforceable . PhaSeal manufacturer website that describes the different components of the PhaSeal device. It details how this CSTD works for drug preparation, drug transport, IV administration and disposal. It also includes a mini-quiz that tests how knowledgeable you are about .